In a world where a lot of core business functions have gone digital, business cards remain vital print products. These study pieces of paper functions as key tools for networking, help supplement your first impression and often serve as a reminder of your brand image. Business cards can be as creative or as straightforward as you please. They are a great way to get across your business's core values in a quick and concise manner. But we'll stop gushing; here is a list of five key reasons why business cards still matter. 1. Show you're prepared: Business cards are a distinct indicator that you are prepared to handle a professional opportunity at any given moment. Whether it be a specifically-designated network event or a social gathering, business possibilities can arise sporadically. By having a business card ready to give a potential partner or client, you are making an immediate impression of professionalism and preparedness. Business cards can speak to your strengths without forcing you to say a single word. 2. Bite-size resumes: It would be unreasonable to ask anyone to keep a resume (or multiple resumes) on them at all times, noted LinkedIn contributor Bob McIntosh. However, business cards can function as bite-size resumes. Not only are the easy for you to carry, they are easy for the recipient to digest. Business cards can display all the essential information a potential business prospect may need on a product small enough to slip inside their wallet. 3. A great direct marketing tool: Jonathan Long, an Entrepreneur contributor, views business cards at the most powerful direct marketing tool in the game. While many digital platforms offer great opportunities for marketing, such as SEO, email marketing etc., nothing beats a solid handshake and a well-designed business card. 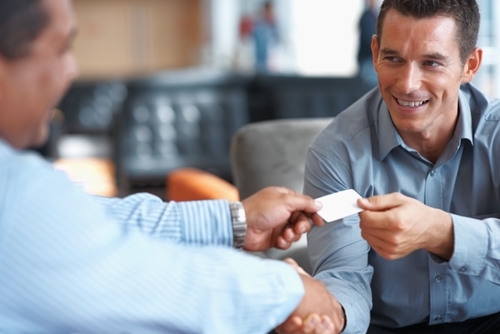 Business prospects connect strongly with the physical contact and will most likely pocket your card somewhere safe, forcing them to encounter the card at a later point. 4. Call to action: Business cards are designed with a clear objective in mind. When a client or businessperson receives a business card, it is usually attached to the promise of future encounters. McIntosh believes this is a major advantage of business cards. He goes as far as to claim that personal business cards increase the chances a person will follow up or give you a call-back. 5. Face-to-face advantage: Perhaps the biggest advantage of a business card is the face-to-face interaction these products involve. The process of handing a business card to a person creates an automatic personal touch to the business interaction. According to The Huffington Post, face-to-face encounters help build trust and credibility with your business or brand. When it comes to forming connection, business cards have digital marketing efforts beat. Alright, so we have you sold on the utility of business cards. But, what should they include? As we mentioned before, business cards should essentially be a smaller, more digestible version of your resume. As such, the card should only include crucial information about how to contact you, your brand and, of course, your name. In his LinkedIn piece McIntosh offered up some key things all business cards should include. The obvious points lie in contact information and social media handles. However one of the more interesting factors comes from the necessity of including areas of strength. McIntosh suggested highlighting some key fields you excel in; simply including "marketing" is too broad. When designing your business card you should point to specific areas of marketing such as public relations, web content or social media. Logos are also good details to include as they present your company brand in a visually-appealing fashion. Another insider tip included leaving the back of your card completely bare. While some people are tempted to fill this extra space with design or more information, McIntosh believes it is more useful for notes regarding your business conversation. He urged professionals to keep a pen on them at all times to let card recipients jot down useful points or suggestions. If your field permits it, try to get a little creative with your business card. Long noted that a creative card is much more likely to get shared among peers thus extending the cards marketing value. Business Insider created a list of the 22 most creative cards and the results were definitely share-worthy. One businessman, Daniel Ballou, shaped his business card like a miniature coin. Ballou explained that because of its size many people keep it out and turn it around in their hands. He claims the card has brought about many new clients for his business. Whether it be a coin-shaped design or just a standard rectangular option, business cards have massive marketing utility for all businesspeople. Print companies looking to expand their sales should consider diving into the world of business cards. It is a print product that will likely be around for years to come.